An eye-catcher amid our gray and stormy skies yesterday morning. A wonderful image, with great colors and perfectly composed! That really is a nice looking barn. Very nice shot. The symmetry of the barn is perfect (down to the wagon wheels on either side) and it's set nicely against the sky. Good work! Love it love it love it! All those magnificent barns in your part of the world, this photo makes me crave for the PNW! Great composition and very nice colors! Love the colors, but the mountains in the background really set it off. 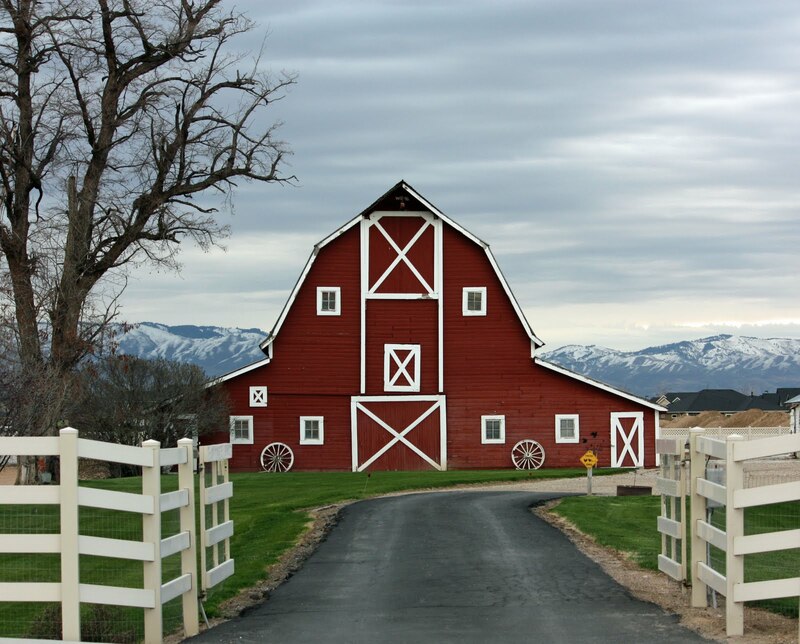 Love those barns, which fit so much the American countryside, with this beautiful red colour. Old time barns. A piece of history to preserve! Now this is a beautiful barn and makes for a great photo! Fantastic find! Wow!! How surprised I was to see my family farms' barn. So many great years growing up there, and my dad was born just to the left of this photo by the large trees near the front of the barn. Thanks for sharing such a great picture! SJ - I'm so happy your family barn is still there. It's become surrounded by development. I keep worrying that one day I'll drive by and it will be gone. It's a beautiful property. Do You Know These Two Clowns? City Daily Photo Theme Day: "Red"